My neighborhood is so beautiful this time of year. Colorful trees all around leaving their mark with all of the leaves on the ground. I decided to take a few pics of what I'm wearing. 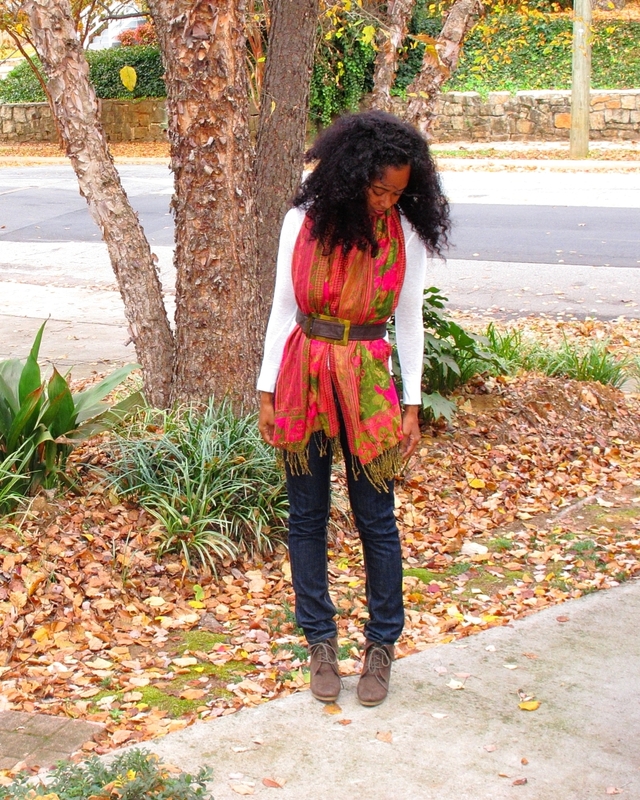 Sometimes I wear my scarves as part of my outfit, instead of as an accessory to my outfit. It's kind of like turning a pashmina into a vest. Vest-mina anyone? I love it Nik. Is this the same hair style from the previous past? You look beautiful here, love the colors in that scarf! D--it's definitely a nice alternative way to wear a nice long scarf! So I was already dressed for my day, But i totally love what you are wearing and im totally re-creating on myself. hahaha. I love this idea! And the colors in it are so beautiful! I never thought to wear it like this! I love it, nonetheless!!!! Scarf looks really beautiful. There are several designs available in the market to choose from. These comes in various styles and colors. If you are willing to buy scarves online then you can check this website out.